After last year's release of the iOS version of the first IPMinfo app, several improvements have been made for the Android version, which was released on 30 September, 2016. One main difference is that the current app is a dynamic one, which requires Internet connection to access the content. 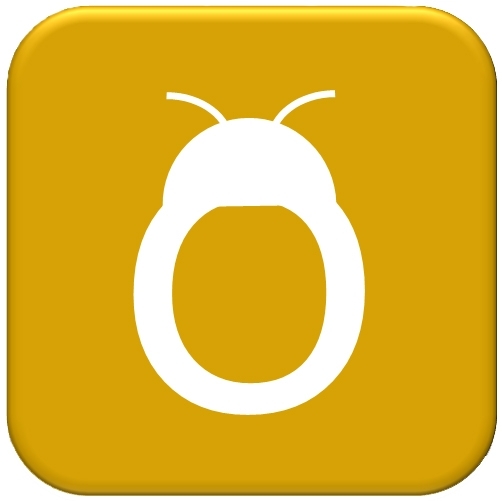 This dynamic nature allows real-time updates to the contents of the app that will be reflected immediately. -An option to add content in multiple languages. 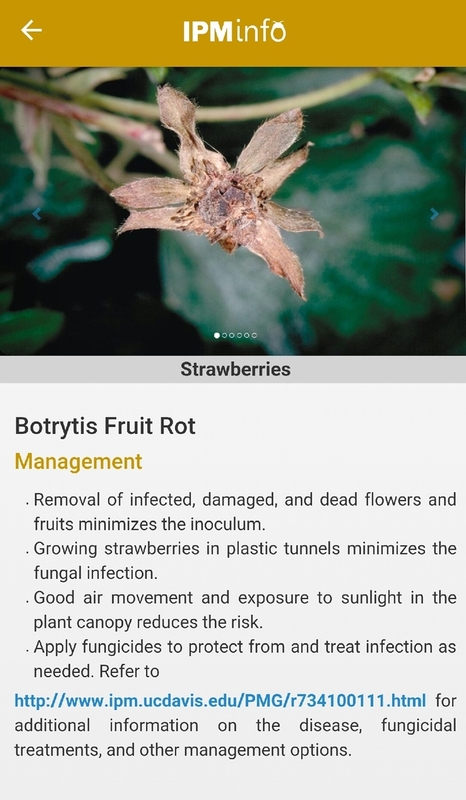 Currently has strawberry pest information in English and Spanish and disease information in English. User can select the language of their choice and change as needed. -Information about multiple crops can be accessed. Currently has strawberry and lettuce will be the next crop to be added. 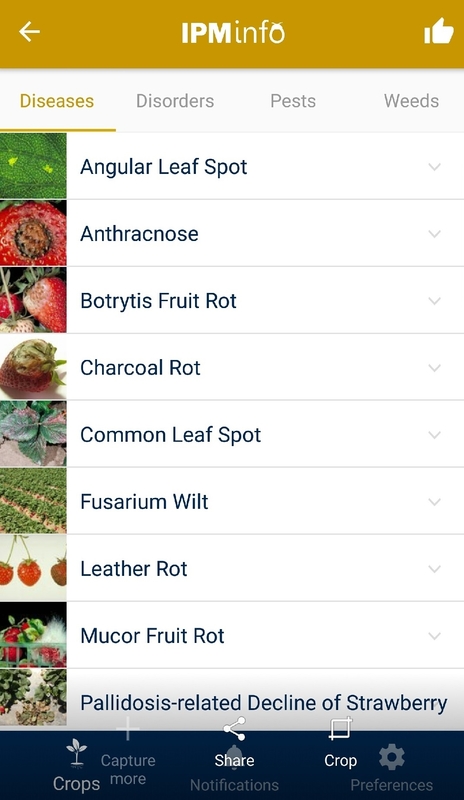 User will have the option to select the crop or crops they are interested so that device memory is used only for appropriate choices. 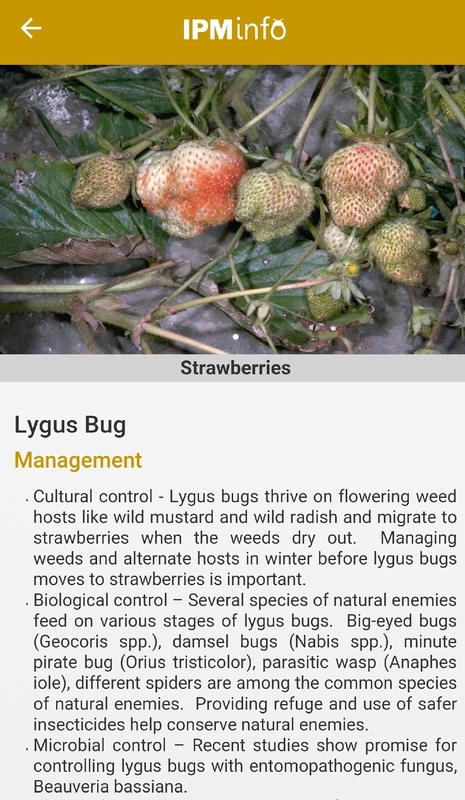 -In addition to pests and diseases, weed and disorder information will also be included. -Search feature allows selection of a particular topic of interest. -Access to extension meeting presentations, handouts, YouTube videos, and electronic journals “PestNews” and “Strawberries and Vegetables”. -An option to provide feedback. 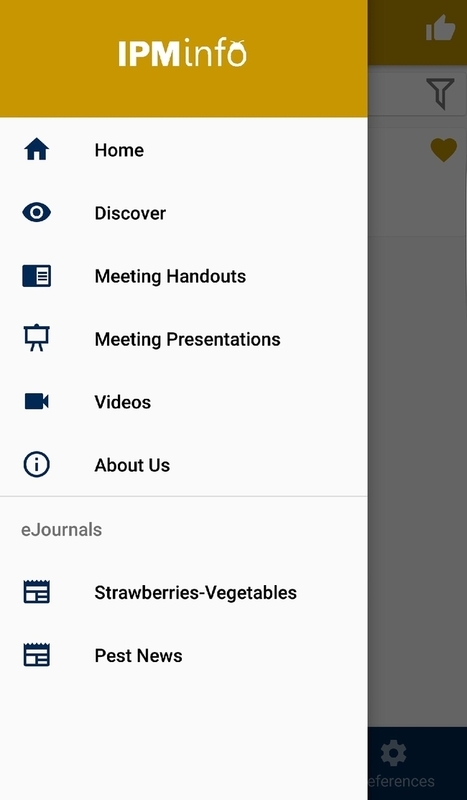 -The notification feature allows sending alerts about updates, new extension articles, meetings, and anything else to the users. Users must turn the notification feature on for this feature to work. These notifications are designed to show up on smart watches as well. 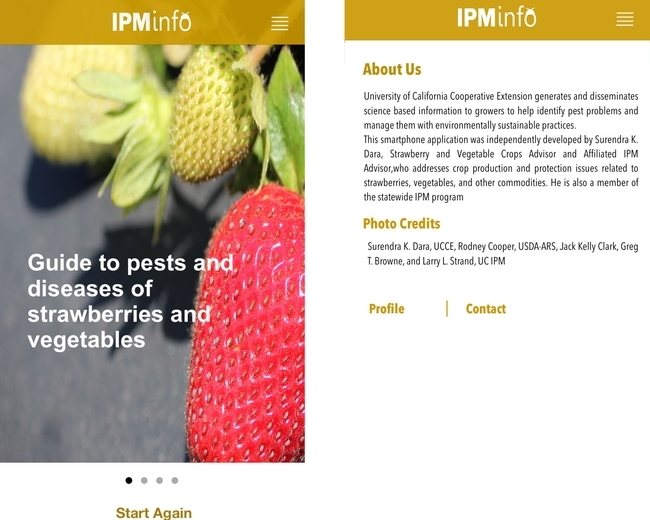 The main goal of IPMinfo is to provide a single point access to pest management information about multiple crops and other extension material so that users do not have to search multiple resources to obtain that information. 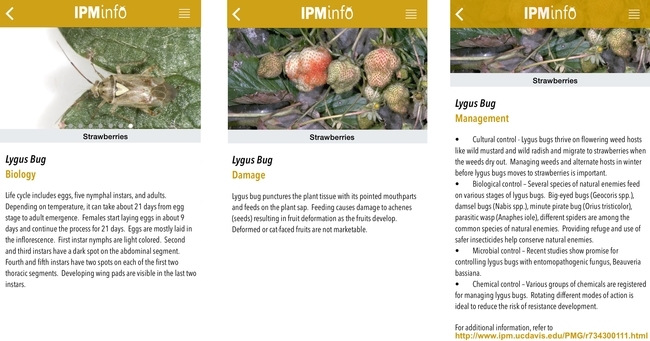 When details of different crops in multiple languages are added, IPMinfo will serve as powerful resource for pests, diseases, weeds, and disorders and their identification and management. 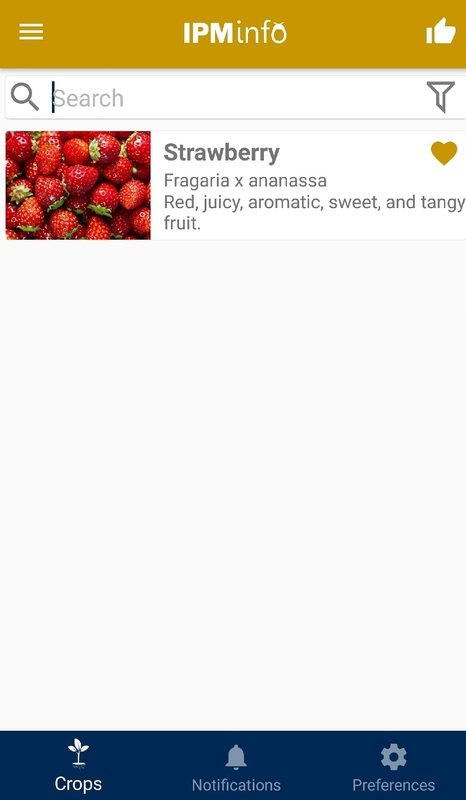 User can select the crop/crops of their interest. A specific topic can also be searched. 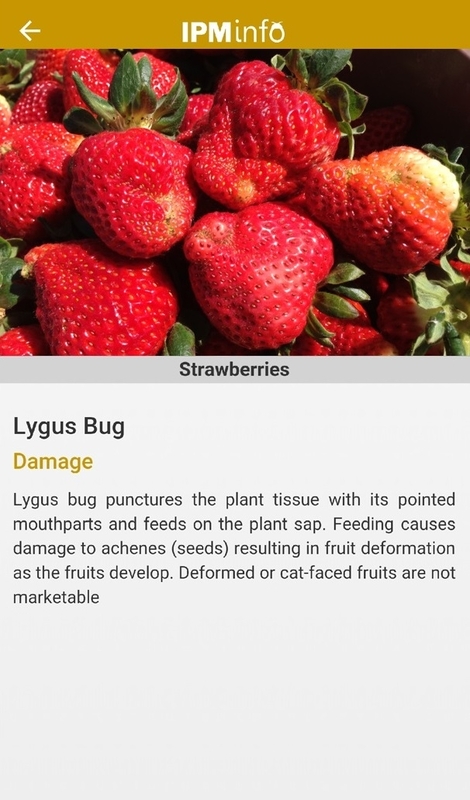 List of diseases, and symptoms and management options for each disease. Disease symptoms and management options. 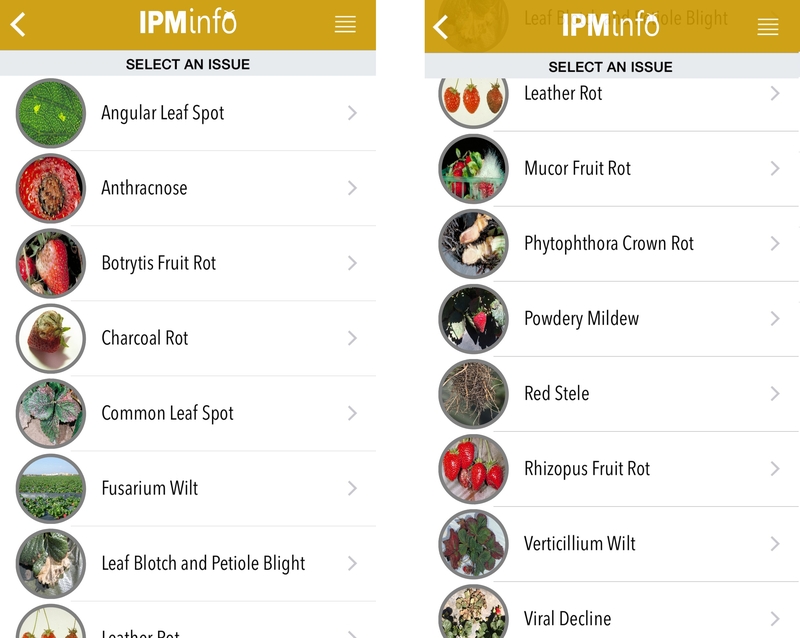 List of arthropod pests and their biology (above), damage, and management options (below). 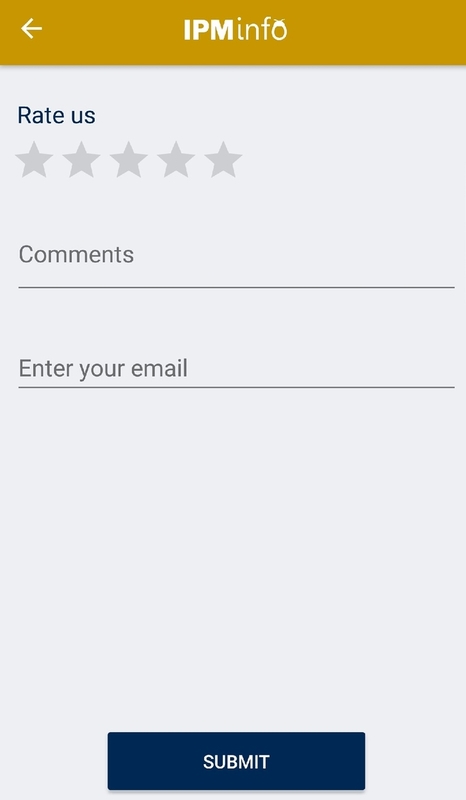 Feedback about the app can be submitted through this feature. 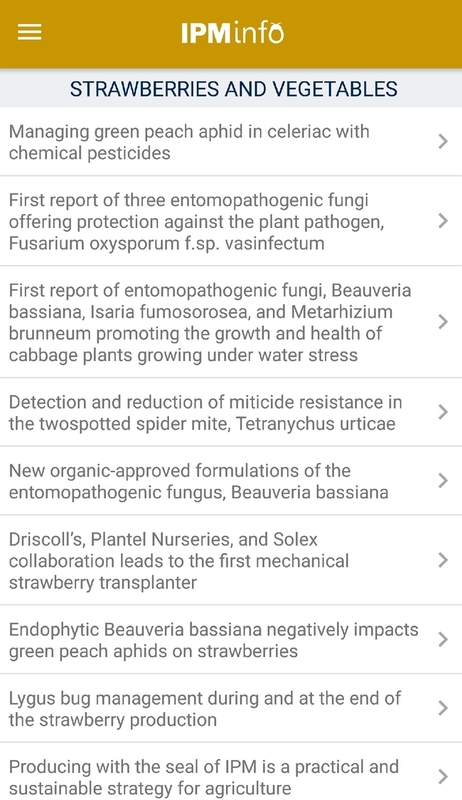 Different information sources can be accessed from the menu options (above). 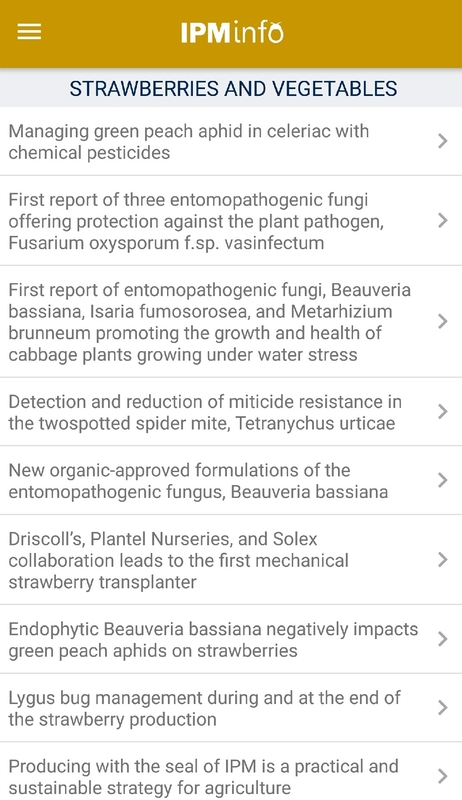 Articles from eJournals (below). Extending research information is an important part of Cooperative Extension. 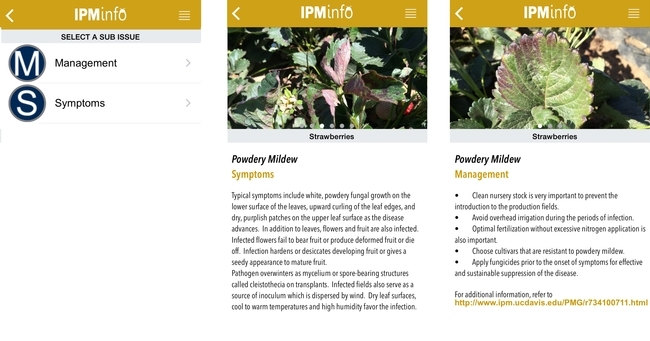 As communication technology is advancing every day, using modern channels of communication are important for successfully reaching out to growers, PCAs, and other key players of the agriculture industry. 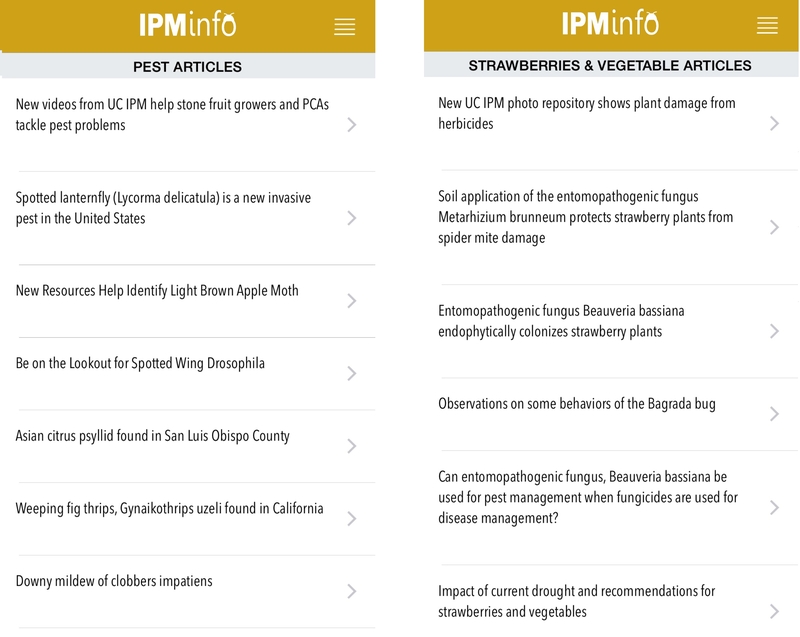 Electronic newsletters - Strawberries and Vegetables and Pest News, traditional newsletter – Central Coast Agriculture Highlights, Facebook posts, Twitter feeds - @calstrawberries and @calveggies, and Tumblr posts, and online repository of meeting handouts and presentations are some of the tools that play a critical role in making important information about my strawberry and vegetable extension program readily available to the agricultural industry. Popularity of smartphones has made all these sources handy, both literally and figuratively. Smartphone applications are becoming popular in agriculture to provide information, monitor various aspects, and for decision making. 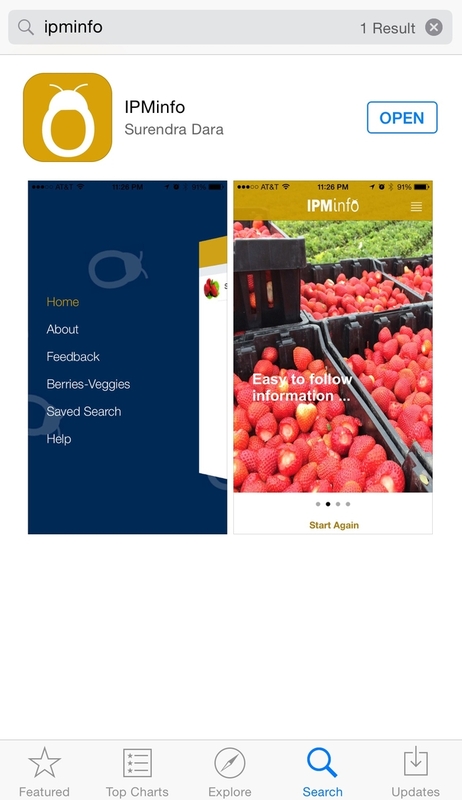 However, there are no such applications to help California strawberry and vegetable growers. In an effort to provide easy access to pest and disease information on various crops, IPMinfo was developed and is currently available for free download for iPhones on App Store. The first version was released in December, 2014 and an updated version was released in April, 2015. 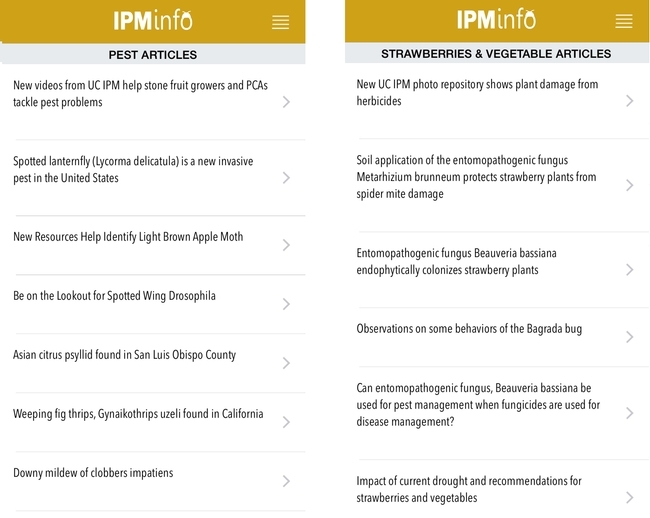 IPMinfo is the first IPM information app from University of California and currently has information on strawberry pests and diseases. 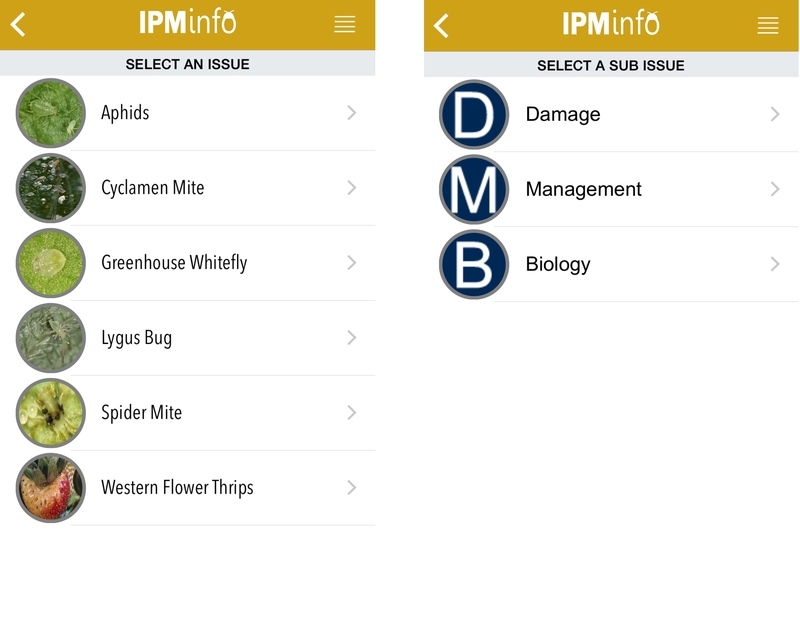 It provides one-touch access about the biology, symptoms of damage, and management options of pests and diseases to agricultural professionals. Home: Takes the user to the crop issues – Pests and Diseases. 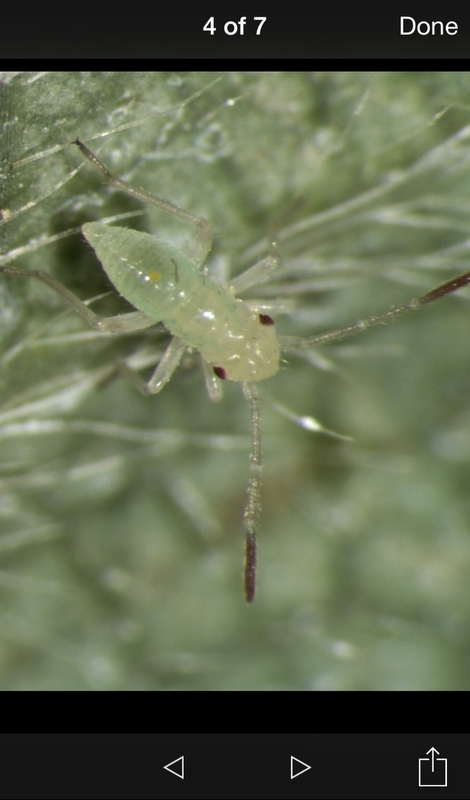 Pests include aphids, cyclamen mite, greenhouse whitefly, lygus bug, spider mite, and western flower thrips. Diseases include angular leaf spot, anthracnose, botrytis fruit rot, charcoal rot, common leaf spot, fusarium wilt, leaf blotch and petiole blight, leather rot, mucor fruit rot, pytophthora crown rot, powdery mildew, red stele, rhizopus fruit rot, verticillium wilt, and viral decline. Each pest has information on its biology, damage symptoms, and management options and associated photos. Links provided on the management section will take the user to UC IPM website that has more detailed information especially about various control options. Tapping on the picture will enlarge and allows the user to zoom in. 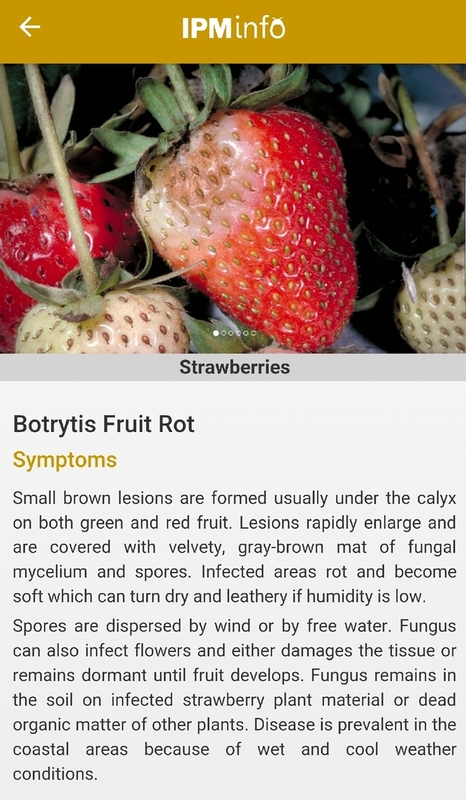 Disease section has information on symptoms and management options along with pictures. After choosing the crop (which is just strawberries for now) either pest or disease topics can be selected. 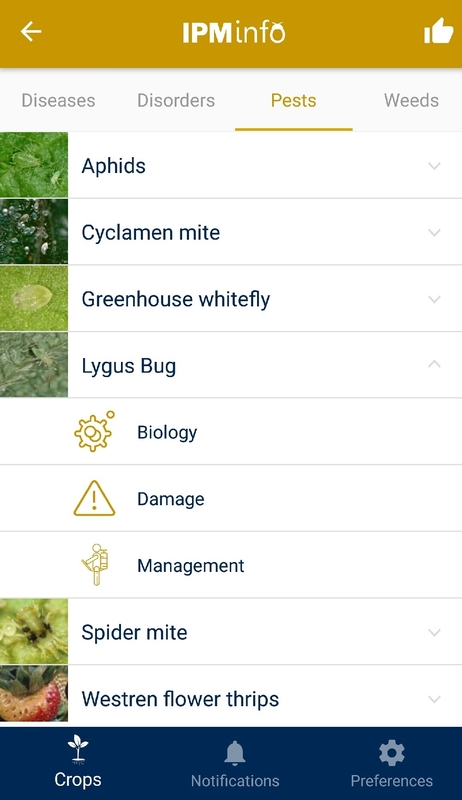 List of the arthropod pests and access screen for biology, damage, and management. 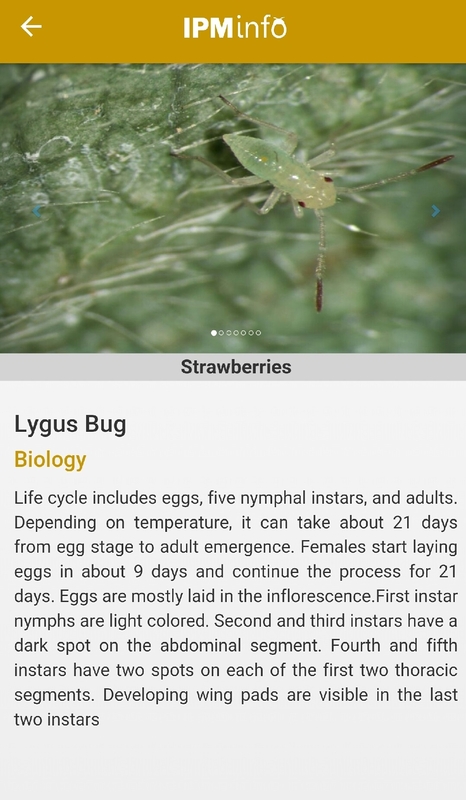 Example of lygus bug biology, damage, and management sections. Double tap the image to expand and pinch to zoom in. 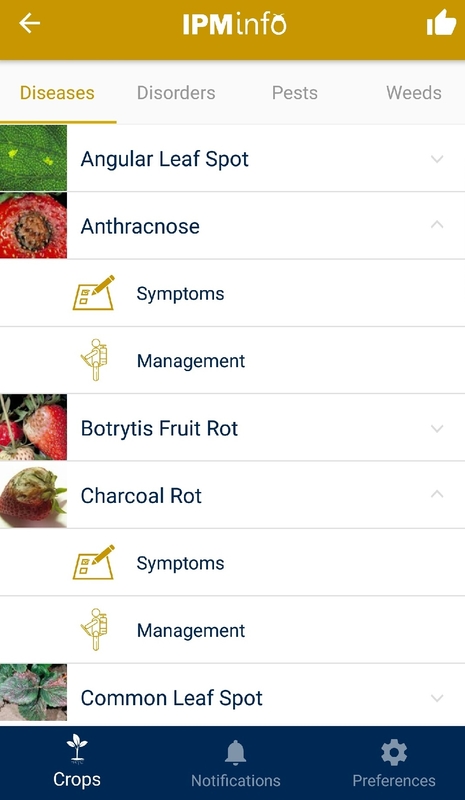 Disease symptoms and management options can be accessed from these screens. Discover: Brief introduction to the app and what it does. About Us: General information about the app, photo credits, and an option to send me an email. Discover the app and send feedback from these screens. 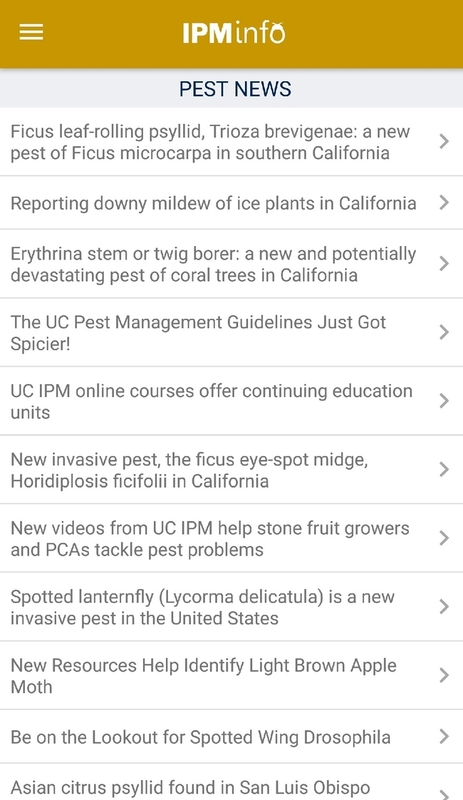 Pest News: Provides a list of articles on my eNewsletter, Pest News. Tapping on the title of the article will take you to the newsletter through the app. Berries-Veggies: Provides a list of articles on my eNewsletter, Strawberries and Vegetables. Tapping on the title of the article will take you to the newsletter through the app. 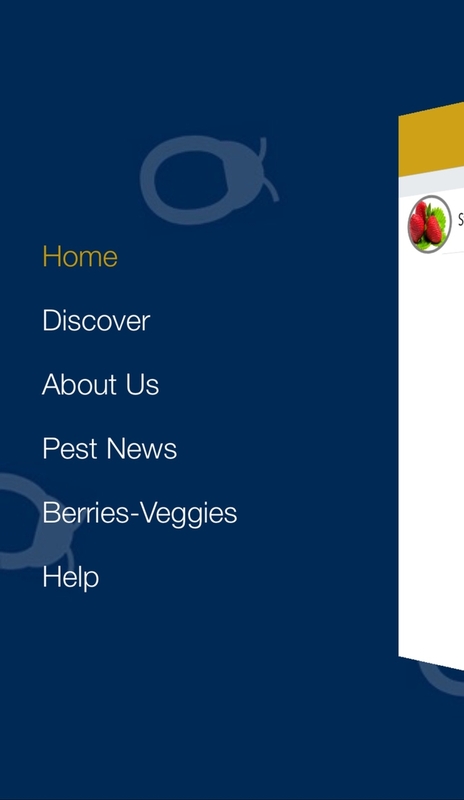 Articles on eNewsletters, Pest News and Strawberries and Vegetables can be accessed from these screens. Having an app for like IPMinfo facilitates an easy access, especially when out in the field or not at the computer, to a quick summary of various pests and diseases, pictures to help identify the issue, and links to provide additional information.